Pulse confectioners sugar, almond flour, and espresso powder in a food processor at about 20 seconds a go until well-mixed. 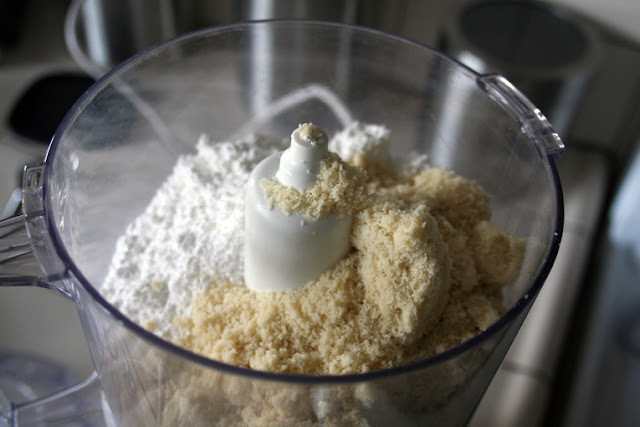 I sifted, to separate any almond flour that clumped, and set aside. In a warm water bath (or a double boiler, stove-top) stir sugar and egg whites together until sugar dissolves. The egg whites will take on a more gelatinous texture and when fully combined, it will lose its grittiness. 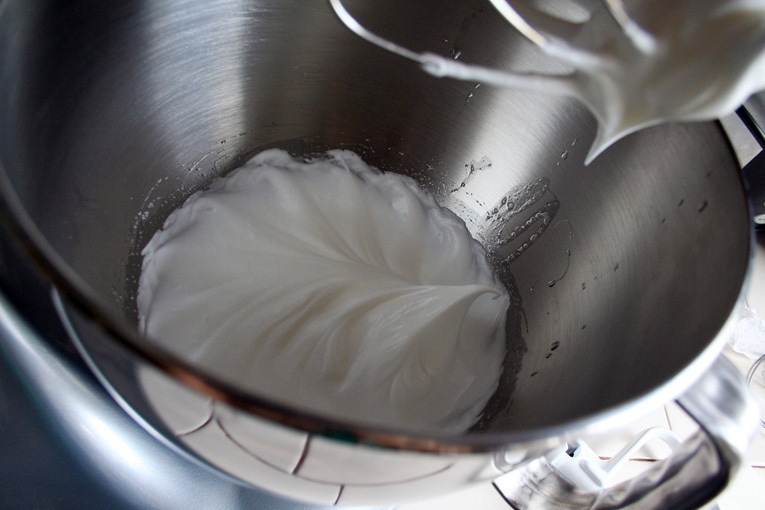 Whip until meringue forms with both gloss and peaks that hold - be careful not to overmix. 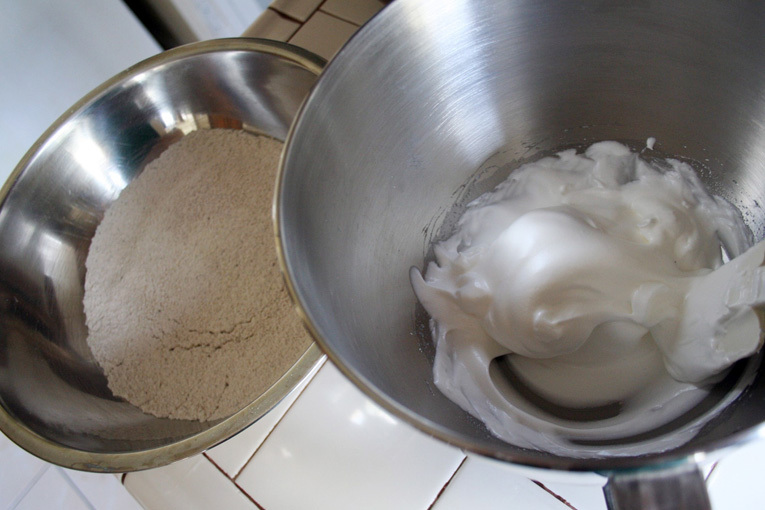 Slowly fold the flour mixture into the meringue until thoroughly mixed. 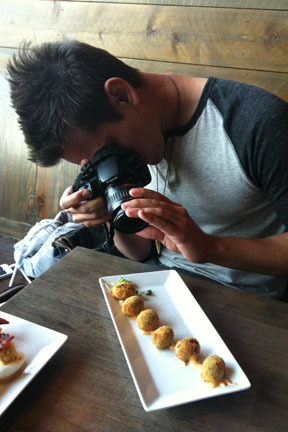 Be sure to scrape the sides of the bowl to the center until color and texture are even throughout. 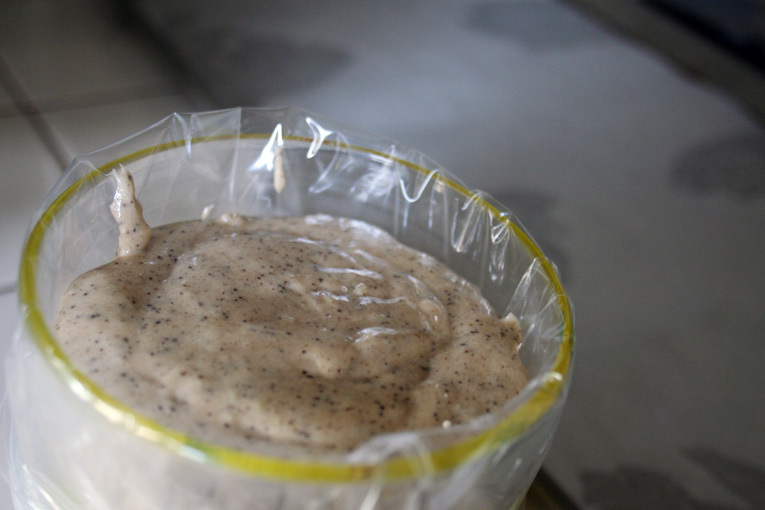 Using parchment paper, line a cookie sheet (I used a touch of oil to adhere to the tin) and pour mixture into a piping bag, or in my case: a plastic sandwich bag - cutting off a small corner when piping. 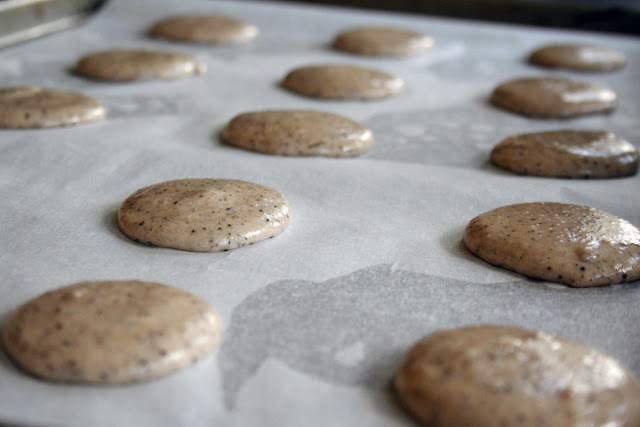 Pipe the macaron batter into dots and allow them to naturally fall into their circular shape; Allow enough space between each macaron for the spreading (1" should be fine). Unlike frosting a cupcake, draw the peak to the cookie's side - it will naturally fold into the circular shape. Allow to set for 20 minutes before baking for the cookie to more securely hold form. Reduce oven from 375 degrees to 325 degrees and bake for 5 minutes, rotate cookie sheet, bake for 5 minutes, rotate once more, and cook up to 2 minutes longer. For the second cookie sheet, repeat the same process: increase temperature to 375 degrees for a few minutes, reduce to 325 degrees, and bake as before (5:turn:5:turn:2). Allow to cool before adding filling. The buttercream is very similar to making the meringue in this recipe: dissolve sugar into egg whites using a warm water bath. Whip into a meringue that is both glossy and has peaks that hold. Fold butter into meringue at a low setting, a few tablespoons at a time, along with peanut butter, until complete. The buttercream will be smooth and really, really hard to not eat by the spoonful! Note - this recipe makes about 1 cup of buttercream. 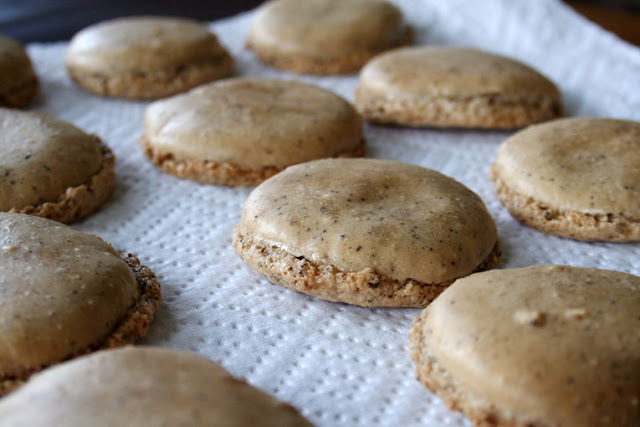 Use about 1 1/2 Teaspoons of filling on the bottom of one macaron and top with the bottom of another, pressing lightly until filling reaches the outer edge. 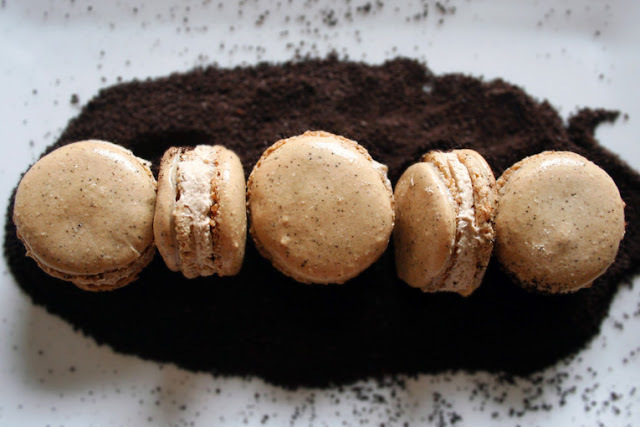 Set aside for about 24 hours before eating for the taste to absorb into the bottom of the macaron shells - that is, of course, if hunger doesn't take over! !